Monday: Asian Peanut Butter Pork Tenderloin – never tried this before, but it’s gotten rave reviews. We’ll have it with rice and green beans. Tuesday: Grilled fillet of steelhead, asparagus, mashed potatoes – steelhead is new to me…apparently it’s kind of a sea-going rainbow trout. Thurday: sweetie and I eat out before seeing Radu Lupu and the TSO. Boys fend for themselves. Friday: homemade pizza and salad. Saturday: Grilled, marinated flank steak for burritos. Refried beans, pico de gallo, guacamole, peppers and onions. My brother-in-law, his wife and younger son arrive from France for a week and this will be their first meal here. Sunday: Buffet dinner for 14 will feature Chicken Spaghetti plus lots of sides/appetizers/fruit and a cake. 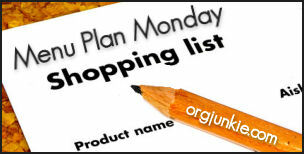 Head over to orgjunkie.com to check out all the other meal plans for this week!